Wegmans recently provided additional details on its anticipated move into North Carolina that will start in the greater Raleigh-Durham area. The company announced a Raleigh location (on Wake Forest Road near I-440) that will open in 2018 as the anchor of a new shopping center. The Raleigh announcement brings the total confirmed locations to three with previously announced Chapel Hill and Cary stores expected to open in late 2018 or 2019. Wegmans joins Publix in its bid to establish a foothold in North Carolina. Publix has quickly grown its presence statewide to 18 stores, according to Chain Store Guide data, with Charlotte serving as the initial focal point for its efforts with approximately half of its current stores located in the metro area. Wegmans, though, will have some direct competition from Publix within the Raleigh-Durham area, where the Lakeland, FL-based retailer currently has three stores. Here’s a look at the current field of play in the combined Raleigh-Durham CBSAs, courtesy of CSG’s custom services team. 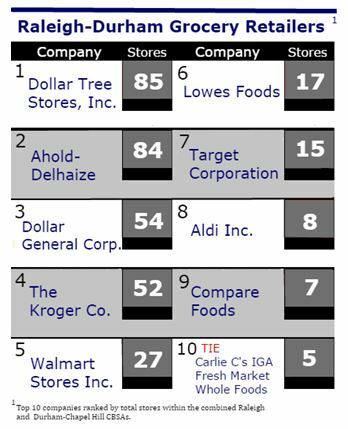 Total grocery sales among the area’s approximately 400 retail locations totaled $5.3 billion in 2015 according to Chain Store Guide’s 2016 Grocery Industry Market Share Report. The combined Raleigh-Durham CBSAs are comprised of Franklin, Johnson, Wake, Chatham, Durham, Orange and Person counties. The population of this 4,000-square-mile area is 1.8 million with an average household income of $84,000.